Want to win some fantastic PC hardware? For our latest giveaway, HEXUS has teamed up with Fractal Design to give you the chance of winning an upgrade bundle stocked full of tasty-looking gear. 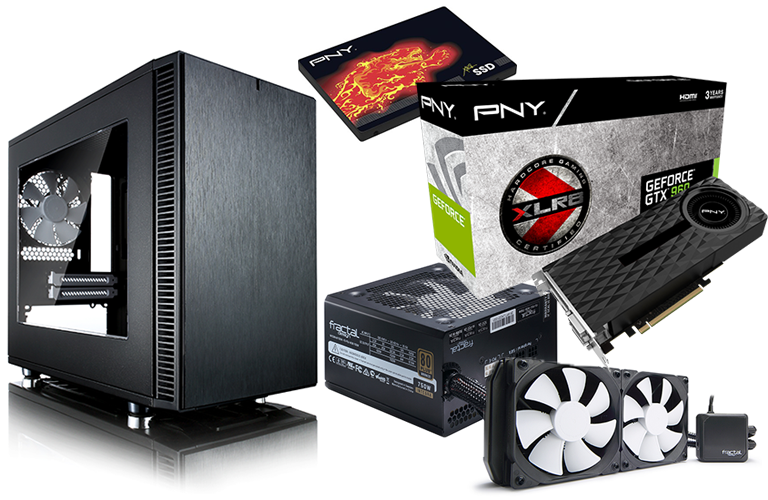 Up for grabs in this incredible competition is a just-announced Define Nano S chassis and four components to help you start your build - a Kelvin S24 CPU cooler, an Integra M 750W PSU, as well as a PNY CS2111 240GB SSD and a PNY GeForce GTX 960 OC graphics card! And here's the best bit: the Define Nano S won't be in stores until March 2016 onwards, so our winner will get his/her hands on Fractal Design's latest chassis before anyone else! Want to be in with a chance of winning? Simply answer the following question to enter our free prize draw, and don't forget, you can also claim a second entry via Facebook to increase your odds! The competition winner will be picked at random from all eligible entries that arrive by midnight of the closing date, February 14, 2016. The winners will be notified via email by February 21, 2016. The winner must claim their prize within 7 days of the promoter sending notification. If the prize is unclaimed after this time, HEXUS reserves the right to offer the unclaimed prize to a substitute winner selected in accordance with these rules. The prize includes a Fractal Design Define Nano S chassis, a Fractal Design Kelvin S24 CPU cooler, a Fractal Design Integra M 750W PSU, a PNY CS2111 240GB SSD and a PNY GeForce GTX 960 OC graphics card.